I am sure my own mum could relate to this, she is 73yrs old but she is still driving kids to school and day care and minding babies and toddlers 5 or 6 days a week, and cleaning up after them. Would she have it any other way, NO, she loves doing it yes there are days when she is so exhausted and wonders why she is still doing these things at 73yrs of age. Now I may not be a mother in-law yet although Kathy-Lee is in a serious relationship and is hoping it is a till death relationship but still I do not think Michael think of me as a mother in-law but that is neither here nor there in my opinion I think of him like a son in-law and I treat him like one too. Tim is very close to his mum in-law in fact God help you if you say anything against him or does anything to harm him because my mum will attack you fiercely as if he was her own child. The same can be said about how Tim feels about mum, in many ways he has been closer to her than he was to his own mother. Tim has called my parents mum & dad since before we were married and he has said many times that my parents have treated him better than his own parents did, Tim wasn’t used to a close knit family like how my family is, he has also said many times that he hopes he is as good a parent as my dad is. A long time ago he said he wanted his daughters to think of him the way me and my siblings think of our dad, it is my dad he strives to be alike. My mum has always treated her son in-laws and her daughter in-law like family and would never say a bad thing about them, even if she didn’t like them much, she would keep her thoughts to herself saying if they make my child happy than I am happy. So do you have in-laws? Do you get along with them? How do they treat you? If you read these words how would you feel? I’m pathetic, I have no job, no hope of getting a job and I need a job, I am barely scrapping by on what the government pays me now and that is going to be reduced next year by around $350 and I am terrified. I can’t sleep because I can’t stop thinking. I need a job and I am never going to get one. I don’t have resume, I don’t know how to write one and I don’t know how to do an interview. I don’t know how to do anything but stupid things that have no real world application. I’m pathetic…………………. I can’t stop thinking about this so I can’t sleep, I am so terrified I want to cry but I can’t cry because I am to tired too, every time I close my eyes I don’t know where I will be or what is going to happen to me in only a few months times. To top it off I am a horrible mother to my son and I have no discipline and I can’t stick to my guns, even if I had them. I don’t know what I am doing, with anything. My life, his life, a job my house, my dogs, I am failing everywhere and I am Terrified and so tired but to terrified to sleep…………. This is a transcript of a couple of text messages I received this morning and I can tell you they left me so sad and feeling helpless, as a mother I want to be able to fix things and make my daughters feel safe and secure and well happy and protected and this makes me feel like I have failed. There is little to nothing I can do to make things better. Well the time has arrived for me to decorate my house for the Christmas season, I do love this time of year, and love to have the house decorated. I don’t go overboard with the decorations, well I don’t think I do but Tim might think differently but he doesn’t say anything about the decorations he should know what I am like after 30 yrs together. In past years I would have Christmas decorations hanging on things around the rooms now I use the decorations that stick to the walls and windows a lot I prefer them now so much easier. I even decorate my car with those stickers that go on the windows. Now you would think growing up in a house that has lots of Christmas decorations up, you would decorate your own home when you move out but I have three daughters and none of them have been big on decorating but they are getting better. I have told my girls you don’t have to do it for yourself do it for your child, as Christmas is all about children in my opinion but not just children there are adults like me who love Christmas as well. So here is the question for this post are you a Christmas decorator, or do you prefer to not have many or any decorations up at all, maybe you are not a Christian and don’t do Christmas I get that, I know we are all not Christians and there are religions that don’t do Christmas that is fine we are all different and all so alike at the same time. However this post isn’t really about my birthday it is more about birthdays in general, so here is my question how do you feel about birthdays? Do you have a problem with telling people how old you are? My nan wouldn’t tell anyone how old she was, she would say that you are only as old as you think you are and your age is just a number. I get that in my head I still feel 20-22 but I have no problem telling people I am 51. I think I look my age, I don’t think I look younger than my age or older than my age I look like a 51yr old woman, I have no wrinkles but I do have grey hair which I dye so I do not feel older than I am. I am wearing a new dress in the above photo which was given to me by my niece Kelli for my birthday. I know some people who look older than their age (my sister Sue), it is no fault of her own it is just the way it is it is a family joke that Sue looks older than she is, the same can be said for my sister Jeannie she thinks she looks older than she is too…………… Sue is only 44 and Jeannie is 45. Do you look forward to your birthday each year or have you reached an age where you are no longer interested in your birthday? Do you think it is just another day and nothing to get excited about? I love my birthday and get real excited about each every year, yes there may come a time when I don’t but then again maybe not, my dad is 71 and he still gets excited about his birthday. I feel our birthdays are special days and should be embraced and enjoyed. 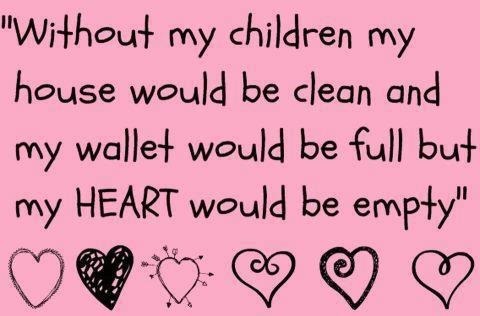 When I saw this on Facebook I though oh so true, I know without my kids my life would feel empty. Everyone knows my family are so important to me and that my life revolves around my family. If a person doesn’t have children is their lives any less full, any less exciting, or any less stressful. I think not, their lives are just different from mine they have different stressing in life and different things that make their lives full and exciting. I don’t understand why people have to be so bloody judgemental of those who do not have children, why do some people feel that the reason they don’t have children is because they can’t have children, maybe they have decided not to have children and if that is the case then so be it as long as they are happy with their decision no one else has the right to tell them they are missing out. Maybe they don’t feel they are missing out, maybe they are happy with being just a couple of a single person without any attachments. Children are not for everyone one, not every single woman on the planet wants to be a mother nor does every single man wants to be a father. Anyway I have not dropped off the face of the earth; I have just gone to Queensland instead, why you ask well for a short break away also to visit family, Tim’s cousin Christine who he hadn’t seen in close to 30yrs and our nieces Kirsty and Kelli and nephew Daemon. Now all them have been seen we are on the way home, should be home sometime tomorrow, have to be home by Wednesday for Tim to go to work and me to watch baby Summer. The trip away has been relaxing and tense in parts, tense because of no real reason it is just that as I get tired and get headachy I get tense and bit short tempered. I had wanted to do a few things in Brisbane like visit a couple of museums but by the time we got to Brisbane everything was closed and so we pushed on to the Gold Coast which is where we spent last night. The caravan parks we have stayed in have been nice but this one has a rundown feel to it and was the most expensive of the lot so far, the only good thing about it was that KFC was right across the road so that is what we had for tea last night. We had a little excitement the motor home stopped on the motorway on our way to the Gold Coast it looked like we would have to call road side assistance and be towed but after Tim spent about half an hour trying to find out who to ring he finally told me to turn the motor home right off as in shut down the GPS but instead I tried it and it kicked over. Sometimes I think it would be col if I could sit at the computer and type a question and have the true answer just appear, then I could either hit delete or save if I save then I will remember the answer if I delete I will forget the answer after 24hrs. Now you maybe wondering what type of questions I would ask well one would be what really happened to Howard Holt, the 17th Prime Minister who disappeared while swimming in 1967. However I would also like to know things like how many grandchildren I will have, will I ever be slimmer again. And of course what do certain people really think of me these types of things would interest me. What about you what type of questions would you ask…………..